This newest fund is the firm’s fourth, and it promises to be its largest to date. Sinovation is a little different from other firms in that it raises its fund using one U.S. dollar vehicle and another in Chinese RMB to give founders currency options, one of its competitive advantages. The firm confirmed today that it has closed the $500 million USD fund, and it has kicked off the process to raise an additional 2.5 billion yuan, or around $400 million, in Chinese currency to round out this new vehicle. The addition of that U.S. capital means it now has $1.7 billion under management across six funds, four of which are in U.S. dollars and two are Chinese RMB. The firm has invested in more than 300 companies, some of which include Meitu (Hong Kong IPO), bike-sharing startup Mobike (which sold to Meituan this month), AI firm Face++, English language learning service VIPKid and crypto mining giant Bitmain. Lee has made his mark in many ways, but in recent years he’s become recognized as an authority on artificial intelligence, both on tracking promising companies in the space and looking into the future at where the tech is headed. So it isn’t a huge surprise that this new fund is heavily focused on what the firm sees as the huge opportunity for AI, as well education and robotics. The focus on deals is at the seed and Series A stages, and, while Sinovation operates in the U.S., it is strongest in the Chinese market. One major factor that does separate Sinovation from other VCs is that Lee and co aren’t just putting money into AI, they are walking the walk, too. The firm created its own AI “institute” last year, and today Lee said it counts around 60 employees, of which half are engineers and a quarter are Ph.D. graduates. It is becoming increasingly common for VC firms to have technical teams in-house, but I’ve not heard of a firm with such a large team. Lee explained that the institute is deployed directly to help portfolio companies and perform due diligence as you’d expect, but it also offers consulting work that brings in revenue for the firm and, by developing IP and experience, it could be used to spin-out future companies. “We have worked on 15 implementation deals so far, with portfolio companies, potential investments, strategic relationships and purely commercial partners,” Lee explained. The Sinovation head revealed that a first spin-out company is likely to be announced within the next month, but he declined to give further details at this point. Lee is more forthcoming on where he sees AI headed, and where the fund is looking to make its mark. While some major AI startups have blossomed in China — including SenseTime, which recently landed investment led by Alibaba at a valuation of over $4.5 billion, and Sinovation’s own investment Face++ — Lee said that “the AI monoliths haven’t come out yet,” even though the early leaders have shown promise in areas like facial recognition. In particular, he sees a future in which AI solutions are customized and tailored to a longer tail of real-life uses. 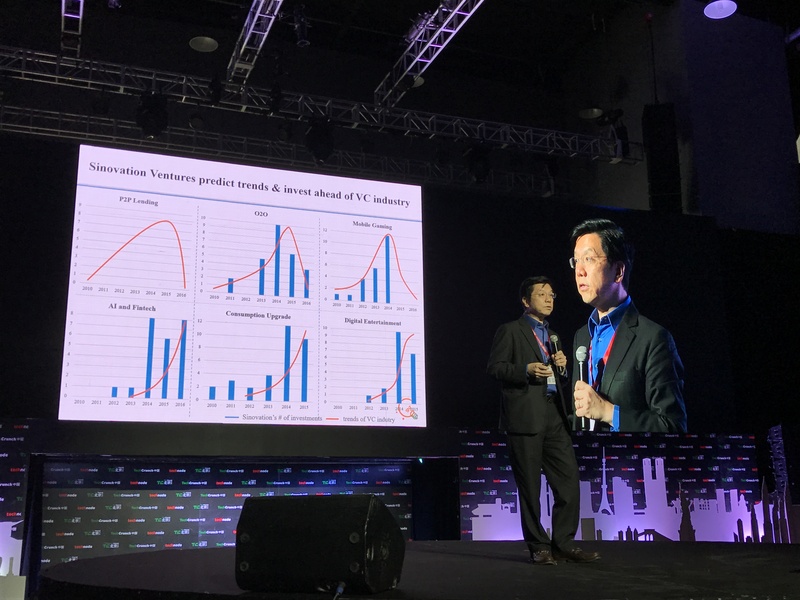 In China, Lee believes that education and offline retail are two very key areas where AI is poised to have a transformation impact, all of which means there’s vast potential for new companies. “Autonomous stores and schools aren’t the core strengths [of existing AI companies.] You look at other cases where you need AI and there will be customized solutions, it’s not all about facial recognition, there’s intent, estimation and more. Then you have sensor networks being upgraded and cameras will capture things involving 3D construction,” he said. Lee suggested that, with this new fund, Sinovation could invest in unconventional areas such as retail stores, or educational centers and then “inject” AI into the businesses, as well as capital, to scale their reach. China’s offline retail push is very real, and a key focus for e-commerce giants like Alibaba and JD.com, which have set up staff-less kiosk projects and made moves to integrate their online services with offline shopping. Alibaba itself has paid out billions to buy pieces of established offline retailers with AI a key component, but Lee sees a gap for enabling smaller players to take advantage of the trend, too. “The fact that 700 million people in China can pay each other with no commission will enable so many business opportunities, essentially it’s a new kind of entrepreneur,” he said. Listening to Lee talk about the future demonstrates why his opinion is so highly respected, and it also goes some way to explaining how the firm was able to close the U.S. dollar segment of its largest fund to date at rapid speed. The firm said that it reached its target commitment from investors within just one month of fundraising. Aside from returning backers, which include a sovereign fund, family offices and a global manufacturer, Sinovation snagged capital from Spanish bank BBVA and an unnamed “leading global automobile corporation,” both of which are making their first investments in China through the deal.